We are always happy to hear your comments. "Darren and his team designed and built wardrobes, shelving and lighting for the three bedrooms in our 1930s cottage. Some of the spaces they worked in were small with unusual angles. The finished furniture is very well made and suits the character of our home and our tastes perfectly. They managed to combine an Arts &Crafts feel for us with modern styles and clever lighting for our teenage sons. Darren and his colleagues were always friendly, polite and very helpful with their design suggestions. We would highly recommend this family-run business." "I would highly recommend Furniture & Design of Oxford. 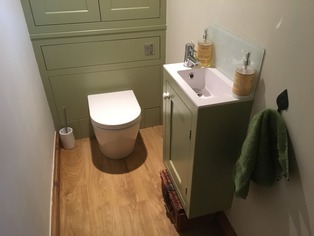 They completely transformed our downstairs loo, making it a much more practical storage space. Their work is meticulous and is finished to a very high level. Darren and Warwick are both so personable and are a delight to have working in your home." What you have said about us . 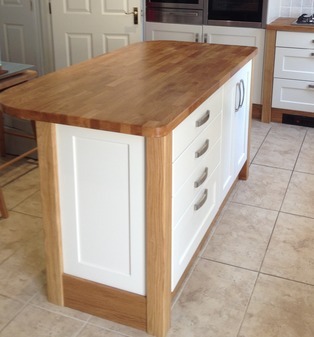 . .
"Darren's passion for designing and building beautiful and quality kitchens was evident throughout the process. Warwick, who carried out the installation was a pleasure to have on site, always considerate with excellent skills. The family team behind the scenes are always friendly and helpful which makes Furniture & Design a pleasure to deal with as well as producing a beautiful result." "Wow, we are so pleased with all parts of the process. From design to selection of colours and materials were all so easy and Darren and Tom were there to assist at every stage. The install was so painless, very quick and it was the extra touches that really added the value. Since the install, Darren and Tom have been back to build 3 window seats, a TV cabinet and a console table. 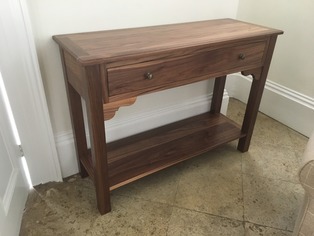 All beautifully designed and built and the console table in particular is a future antique. Next stop fitted bedroom furniture! 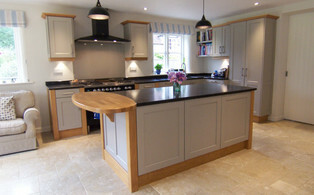 "Darren is passionate about designing and building kitchens! His knowledge and input at the design stage of our house renovation was invaluable. The quality of workmanship in the finished product is second to none. It was lovely to be able to pop into the workshop whilst our kitchen was being built and meet the rest of the highly skilled team at Furniture & Design. 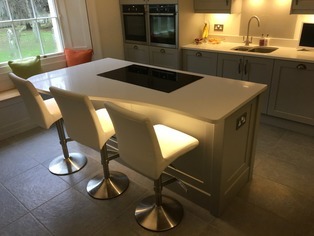 We could not have been happier with our kitchen and the service provided and would not hesitate in recommending Furniture & Design to our friends". “A flair for stylish but practical design, supported by skilled craftsmen working out of modern facilities allowed Furniture & Design to provide us with an excellent service and exactly what we had requested. Always pleasant to work with, they had the flexibility to design and build fitted kitchens, wardrobes and bookshelves that gave modern levels of functionality whilst still respecting the character of properties as diverse as Victorian cottages, large Edwardian villas and detached new build houses." "We wanted to write and thank you for all your and your team's hard work in helping to design, to install and to finish our new kitchen and utility rooms. We are very pleased with how the rooms have turned out. Throughout, you have always been on time, cheerful, patient with our enquiries and engaging with our boys. These are great qualities which both of us hope will continue to serve you well for many years to come." "Excellent quality and service from everybody. We couldn't be more pleased with everything you have done. Everybody that has visited has been highly complimentary. We would not hesitate to use Furniture & Design again." "You completed our kitchen in February 2007. I must say it's a credit to you and your staff as it looks and is as good as the day you fitted it. Since then I have not even had to adjust any doors at all, or any other parts, just a wipe down and that includes the paintwork. 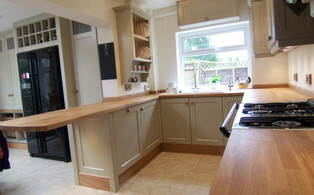 I would like to thank you and Tom for what you achieved in refurbishing our kitchen." beautiful drawings which ultimately became a reality with which I am delighted to live every day. Darren and Warwick did the fitting with plenty of other trades getting in their way and dust, noise and mess everywhere. This must have been frustrating for them but they were unfailingly polite throughout the process. Darren came back promptly to make a few minor amendments and to fit handles at the end of the project. I would use Darren again without hesitation and thoroughly recommend Furniture and Design. They are really nice people who do an excellent job." 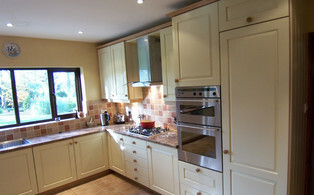 "I am really delighted with the lovely bespoke fridge-freezer doors you manufactured for me. Both the colour and design are a perfect match and the quality far superior to my existing units! 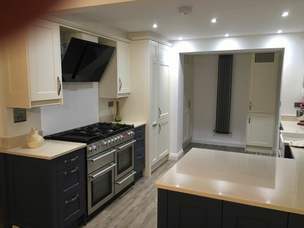 Very many thanks for taking on this small job for me, which I greatly appreciate, and I will certainly bear you in mind in future should I decide to go ahead with a full kitchen refurbishment at a later date." "Just about every day I say a big thank you for my kitchen - it's revolutionised my life." 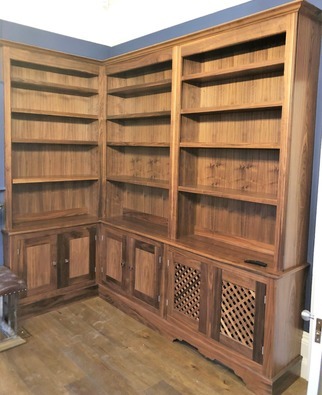 "If it's quality workmanship you're after, then Furniture & Design is the place to go. Having discussed with the team what we were looking for, they created and installed a custom built unit which is just perfect." "Darren and his team have been brilliant right from the start - guiding us through design options with meticulous attention to detail, making innovative suggestions to provide a beautifully crafted unique kitchen which is a delight to live in. They were a pleasure to have in our home, got on with their work quietly and efficiently and always left the kitchen clean and tidy." "We embarked on an ambitious remodelling of the whole ground floor of our house, part of it being knocking a kitchen and dining room into one room. Darren and Tom were brilliant, taking our thoughts and ideas and turning them into a beautiful kitchen. They worked well with the builder, floor layer, electricians and decorators to give us a perfect kitchen which was stylish and practical. Nothing was too much trouble and when we changed our minds they simply accommodated our requests. quality at a reasonable cost then this team will deliver." 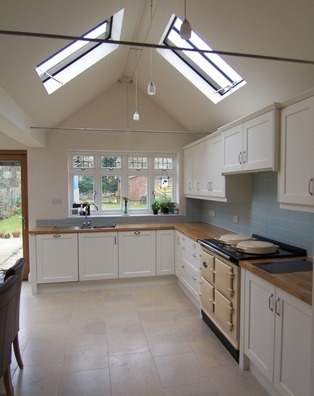 "We are still so pleased with our kitchen, I feel that you listened and took on board what we were trying to achieve when you designed and built our kitchen. The quality of the cabinetry is superb and the attention to detail really shows. I am sure that the kitchen will stand the test of time as the design and style will not date, and I know it would have added value to our property. I would also like to thank you for coming out and rectifying the couple of problems that we have had, even though they didn't involve your cabinets. It shows that Furniture & Design are willing to go that extra mile to make sure customers are happy. Because of this we have recommended you to a couple of our friends who have now had kitchens from you too. We are so pleased with the work that you and your guys did for us that we were also happy to do an article in Beautiful Kitchens Magazine showing our lovely kitchen. We wish you and the staff at Furniture & Design the very best." "We have had work done by Darren and his team, including a completely renovated kitchen, a laundry room and a bedroom. On each of these three occasions I have been extremely impressed with his innovative ideas, his finished product and the relatively reasonable cost for such a high standard. I would not hesitate in recommending Furniture & Design to anyone, and would be delighted to show off the areas concerned." 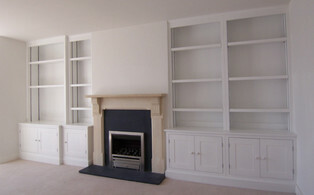 "We are very happy with the work carried out by Furniture & Design Ltd who have a very fine eye for detail. 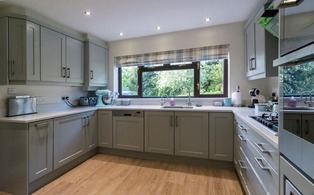 Our resulting kitchen has been much admired by all who have seen it." ideas about what we wanted, whilst giving good advice about the practical aspects. The quality of the workmanship is very high; everything feels solid and durable." 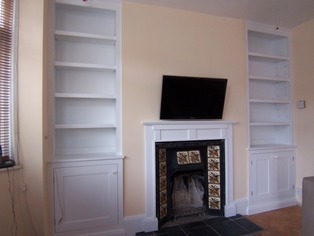 "We hired Furniture & Design to build a shelving unit for our front room with a matching fire surround. Didn't want it to cost the earth, but still wanted it to look good. Darren and his team were professional, courteous and great to work with. From first contact through to the final installation, they listened to us and delivered exactly what we had requested. Couldn't recommend them highly enough!" "I can warmly recommend Darren Wells and his team at Furniture & Design. They are all professional, efficient, friendly and helpful and the outcome of their work is transformation and total satisfaction. Darren designed and installed a kitchen for me some years ago now and he was impressive in his grasp of what we wanted and how a multitude of specific problems could be solved. No detail was too small for him to attend to and the overall effect is still superb after some years of functioning. Since then I have asked him to create bedroom furniture, fittings in a utility room, which is also used as a small art studio, and what turned out to be a very fine set of glass-fronted and open oak shelves with cupboards and drawers beneath covering one wall of our dining room. This has been admired by everyone who has seen it. Darren is a master of finish and of lighting and the superb functioning of his furniture is matched by its well-designed lines and aesthetic appearance." 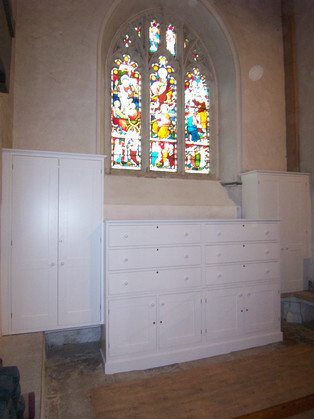 "Darren has also recently undertaken a major project to create vestry facilities in our local church (All Saints, Cuddesdon) and that has transformed the appearance and use of a transept within the building and provided high-quality drawers for vestments and altar covers, as well as a wardrobe and smaller cupboards. Darren had to design furniture that fitted around a stone bench that could not be removed and this further demonstrated that he is a designer who solves apparently insuperable problems. His drawings and plans impressed even the Oxford Diocesan Advisory Committee and his workmanship and that of his team is evidently of the highest quality". If you would like to discuss your handmade kitchen, bedroom, bathroom or living space furniture please call us on 01865 370222 or 07779 272811, or alternatively click here to complete our short contact form.